"No one has ever been loved so much by the people. Don't waste that power." Opening with a battle sequence that plays like a watered down version of his opening to Saving Private Ryan, Lincoln wastes no time getting the title character in front of the camera. 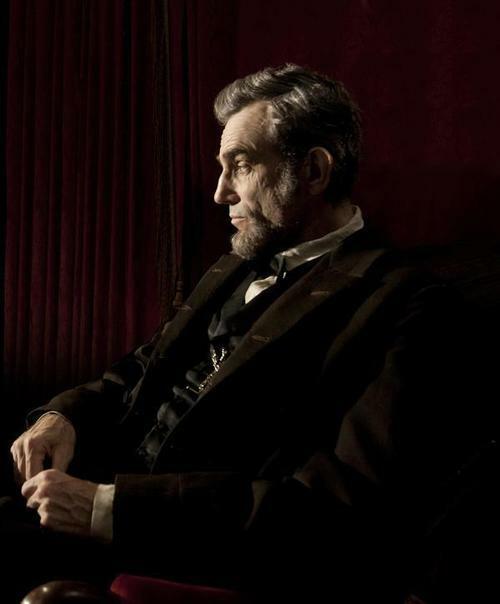 This is not a film interested in keeping Abraham Lincoln (Daniel Day-Lewis) at arm's length, or buried behind a facade of mystery. It attempts to give the audience some insight into the inner workings of his mind and political process. The film settles quickly into its main plot, the attempt by Lincoln to get the 13th Amendment to the Constitution passed by the House of Representatives before the South surrenders to the North, ending the Civil War. Time is of the essence, as rumors of the South's surrender are eminent, and The Emancipation Proclamation only provides the slaves their freedom under the conditions of war. Therefore, they must adopt the 13th Amendment, which would grant them unequivocal freedom, in under a month. And that is, essentially, all that the film is about. 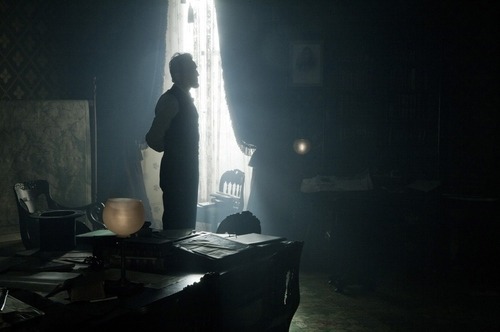 Yes, there are other subplots and minor dalliances to some of the more personal drama in Lincoln's life, but for the most part, the film is focused squarely on the back door political dealings that were done to end slavery in America. I don't say any of that to be catty, it's just an unusual amount of focus on so short a time for a film that calls itself Lincoln. Granted, it presents his presidency in microcosm, and I have no issue with that, it's just an awfully long winded 150 minutes, and at times plays out as if it were in real time. Having said that, there is a ton to admire about the film, not least of which is the epic restraint being exercised by several people not necessarily known for quiet restraint. Spielberg, in particular, doesn't crowd the film with the pompously self-important imagery that has bogged down other films of his (I'm looking at you Amistad.) That being said, the moments in which he does do this, such as Lincoln's son Robert (Joseph Gordon-Levitt) watching some men burying the limbs of wounded soldiers, stand out more for their heavy handedness than they would in most other Spielberg films from the last two decades. Kudos must also go to John Williams, a composer that I have no shortage of gripes with, for his equally restrained and melancholy soundtrack. Some tracks are just a lone piano, and he saves his sweeping melody for the end credits, which makes it all the more effective by not instructing the audience on how to feel at a given moment. This is his finest work since Schindler's List, and the kind of score that goes unnoticed for most of the film, the true mark of a great score. Ditto the cinematography by Janusz Kaminski, which was elegantly understated. It did strike me as a bit odd that Spielberg shot the film in a 2.35:1 aspect ratio, particularly since he almost always works in 1.85:1. The film is very much a chamber piece, and opening up the frame like that was a strange choice, but his composition is almost always solid, and never distracting. And I would be remiss if I didn't mention the script by Tony Kushner, which is jam-packed with quotable lines and authentic dialogue that doesn't sound like it was cribbed from Bartlett's. The performances are as good as you could hope for from this cast. Day-Lewis is fantastic, as always, and in a much more relaxed and calmer mode than we're used to seeing him operate. He commands the screen with a quiet intensity that is in every way as effective as his more operatic performances in the past. Sally Field is also wonderful as Mary Todd Lincoln, reminding us how fantastic she can be when given good material. Among the supporting cast, there are a number of stand-outs. The comedic trio of James Spader, John Hawkes, & Tim Blake Nelson are great as the men hired to try and persuade some of the lame duck Democrats to vote for the amendment. Jared Harris has never looked or sounded more like his father, and rises to the task of playing Ulysses S. Grant. Lee Pace shines in a small role, oozing villainous overtones. 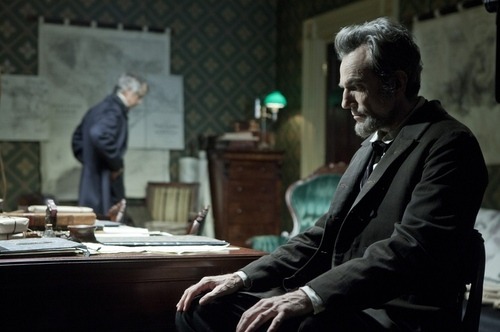 Tommy Lee Jones is equally effective as Thaddeus Stevens, though he's not quite as good as David Strathairn as Secretary of State William Seward, who is probably the star of the supporting cast. And special mention should also be made for Gulliver McGrath as young Tad Lincoln. His scene when he learns of his father's death is soul-shattering and really struck a chord. While it's certainly not the sappy, white-washed version of history that the trailers would lead you to believe, Lincoln is not without its faults. To focus in on such a small period of time, they should have shaved about thirty minutes off the running time, or opened up the world a bit more. As is, it's a flawed film that just misses the mark. There's a ton to admire, and I would be willing to bet that you'll likely enjoy the film, but I would be hard pressed to say that it's an easy film to love.